The Guajara walk is one for experienced, fit walkers only. The high altitude makes the trek pretty arduous. The Guajara mountain, at nearly 9,000 feet, is the fourth highest in Tenerife and, if you make the effort to reach the summit, you will be rewarded by superb, breathtaking, panoramic views of the surrounding mountains, the Cañadas caldera and the pine forests. To begin the Guajara walk, you need to get yourself to the Parador de Las Cañadas Visitor Centre, which itself is already 7,000 feet above sea level. Also a hotel, it offers all the usual amenities for guests - including a telescope, as the air is so clear for viewing the heavens! 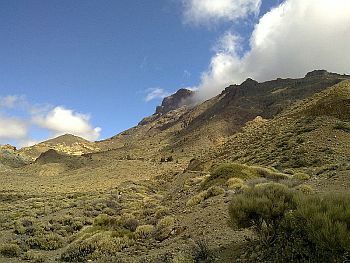 It is situated in the National Park, accessed by the TF-21 road, from Vilaflor to the south and La Orotava to the north. If you go by car, there are parking facilities there. A bus also drops off at the Parador, but please be aware that the maximum time you have before the last bus available will take you back is five hours. The mountain of Guajara looms over this Parador and seems pretty close by, but, to start the climb to the summit, you first have to walk over a mile to the east on a wide jeep track. In the end, you turn right, off this easy trail and then the climb proper begins. You're faced with a steep incline and only a narrow path. It is illegal to deviate from these recognised pathways, as much for safety reasons as anything, I suppose and the park rangers regularly patrol the area to check on this. You've been warned! Eventually, you come to a spot where the path splits four ways. One way leads to Montaña Pasajiron, one leads straight on into another valley, but the other two are both routes to the summit of Guajara. The thing with these two alternate routes is that one is reasonably easy and one is rather tough, in that it's quite steep and dangerous. If you think you can handle the harder route, it's a good idea to use one for the ascent and the other for the descent. As mentioned earlier, conquering Guajara can be challenging, but has the reward of the stunning views from the top. If you've elected to descend by the more difficult route, please be careful! It truly is very precarious and, on the way down through the Ucanca Pass, you may be buffeted by gusts of winds and, depending on the time of year, snow flurries. The Guajara walk is graded as "challenging" and is only recommended for experienced hikers with good levels of fitness. It is not advised for anyone with heart or lung conditions.